Dhaka, 19 August, Abnews: The existing slums in the city would be replaced by multi-storey buildings to allow the inhabitants to live in a healthy and better condition. Prime Minister Sheikh Hasina announced this today while laying the foundation of Dasherkandi Sewerage Treatment Plant at a function at Hotel Sonargaon here today. “There would have no slums in the city, rather 20 storied buildings would be constructed for slum people where they would live by giving rent on daily, weekly and monthly basis,” she said. “Poor people come to cities for many reasons and live in shanties… we need them every day in our daily work. So, they need a better atmosphere to live,” she said. Sheikh Hasina said slum people will be able to live in flats in exchange for the same amount they now pay for living in slums and we have to give attention to proving them with a standard life as country’s economy is getting better. “Benefit of the country’s economic progress would not only go to the higher-class people, poor people should also get the benefit of the development,” she said. The Dasherkandi Sewerage Treatment Plant is being constructed at a cost of about Taka 332 crore with Chinese government’s support as part of the Dhaka WASA’s master plan to bring the city under pipeline sewerage system by 2025. Four more sewerage treatment plants would be constructed in Dhaka City to put in place a sustainable and environment friendly water management and sewerage system under the master plan. Two of the sewerage plants would be constructed at Pagla and Uttara with World Bank support and two others at Rayerbazar and Mirpur with the assistance of Asia Development Bank (ADB). LGRD and Cooperatives Minister Khandakar Mosharraf Hossain, senior secretary of local Government Division Dr Jafor Ahmed Khan, and Chinese Ambassador to Bangladesh Zhung Zuo aslo spoke on the occasion while managing director of Dhaka WASA Taqsem A Khan gave the welcome address. The prime minister reiterated that the box culverts built illegally in the city destroying the water drainage system and canals would be demolished if her government comes to power next time. The water channels would be restored and elevated roads would be constructed there for vehicular movement. Multi-storey housing facilities would be extended to Dhaka’s suburban areas to reduce pressure on the capital, she said. Sheikh Hasina appreciated the WASA employees for their sincere services to make the public utility body as an effective one during the tenure of her government. However, she urged them to remain alert about those people who create unwarranted trouble in implementing a development project. Sheikh Hasina said Dhaka WASA was beset with irregularities for a long time. Awami League government during its 1996-2001 tenure had taken many projects to free it from those irregularities, she said. But, the development projects of Dhaka WASA failed to continue its pace after change of the government in 2001. Success in implementation of development projects is now visible due to continuation of the government in 2014, she said. Laying importance on regular dredging of the rivers and canals, the prime minister said surrounding rivers are the main sources of water for sewerage plants of Dhaka City. So, the government has already undertaken projects for removing the sludge from bottom of the rivers, she said. Sheikh Hasina said the water flow of the Jamuna River is being joined with the rivers surrounding Dhaka to increase their tides in lean period. Dhaka WASA would continue its efforts to protect the existing canals, she hoped. Pointing out the steps taken by her government to ensure production and supply of water, the prime minister said development partners now consider WASA a role model in South Asia in giving water services. 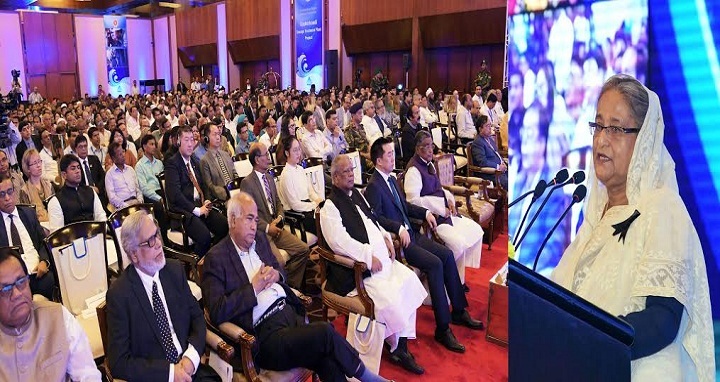 Sheikh Hasina urged the concerned officials to work sincerely to achieve the SDG Goal No 6, which envisages a safe drinking water and sewerage system by 2030. The government has also prepared ‘Bangladesh Delta Plan- 2100’, a 100-year plan to ensure long-term integrated water management, she said.